These are standard 0.1" pitch dual-row pin headers designed for PCB mounting. 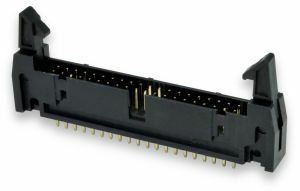 These are male pin headers designed to accept standard female socket connectors, such as the Winford DSI connector series. The DH series connectors have a polarizing slot in the middle to ensure correct orientation when used with a polarized socket connector. These are straight connectors, as opposed to right angle. Winford Engineering uses these DH series connectors on our dual-row header breakout boards. They have proven to be durable and reliable.